Welcome to this small, yet mighty oasis where gentle and powerful co-exist. With all my heart, I'm thrilled to meet you here. I believe there is a defining moment in every soulful creative woman's life when she realizes that plan B isn't an option. She must go where her heart is leading her, and live the untold story within. This is the TRUE definition of Courage: To own the story of who you are. You are so brave for listening to your heart. For finding your own way in a technicolor world. If you have arrived at this defining moment, I celebrate you!!! I also know about this burning desire to inspire and awaken the hearts of others, and how your deep feeling nature can leave you questioning what Leadership looks like for you. While your inner revolution may look graceful on the outside, I know the ferociousness it takes to burn old patterns of hiding, sabotage and self doubt. I want you to know you aren’t alone. This is where I am so passionate about supporting you to create your highest reality. For thousands of years people have turned to crystals during times of change; to support their initiation, expansion, healing, creativity and leadership. Your Mikala Jewelry isn’t just another pretty accessory . . . It is a love infused, hand crafted talisman; a “lionhearted” symbol of your brave and courageous commitment to YOU. It is a reminder; because the journey can feel lonely at times, that there is a community of deep feeling visionary women just like you, who are embracing the untamed path. Today I want to remind you - the world needs YOUR love. You are chosen, Dear Lioness. 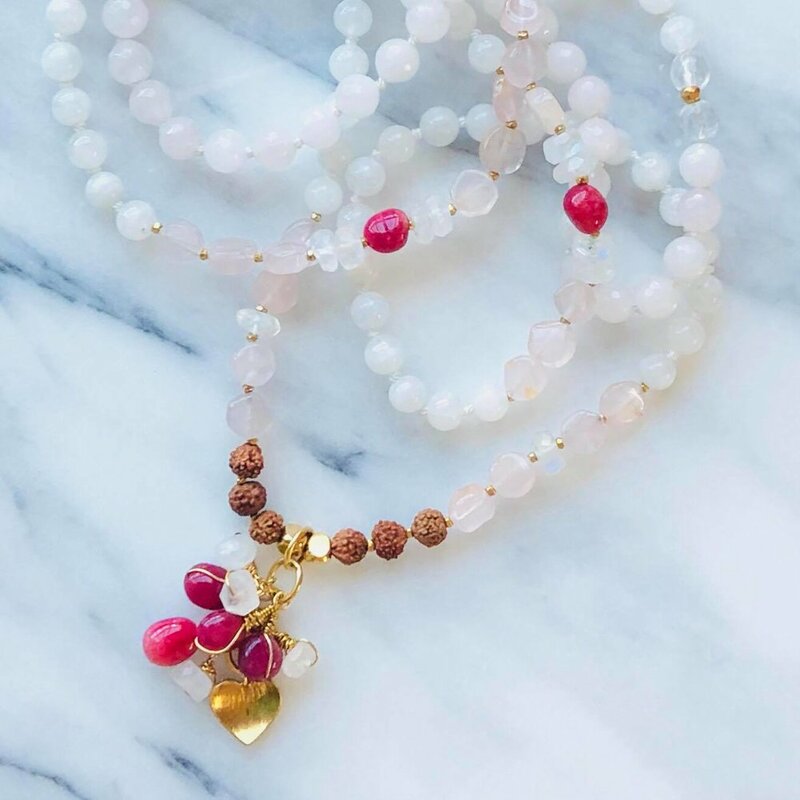 Whether you are birthing a creative project, coming home to yourself, or deepening your spiritual connection, Lion & Lioness spirit medicine is here to support you with its strength, radiance & power. I am honored to meet you here; at the threshold of this powerful and defining moment in your life. Because we believe Love must be infused into everything we do, and because you are unique in your gifts, we create limited edition pieces to reflect your radiance and power. Join the pride of Lionesses for special updates and access to the limited edition collections. Because once they are gone, they are gone. . .
Absolutely beautiful pieces are created by Mikala Jewelry. You can see the care and intention behind each one. I was referred to Monica while looking for a prayer mala. I was so impressed, I purchased additional malas for family members. Again, the craftsmanship and design of each piece was phenomenal. Your heart is your ART. A powerful vision of a "Lion King / Sun King" man / teacher / leader came to me in 2013 followed by a series visions through 2013 to 2016. A black jaguar came in a vision (2014) during a time when I was exploring South American shamanism. The black jaguar identified herself as MIKA and said. "You will know me by the Breath and the Wind." Mika means "Gift from God" or "he who is like God" (hebrew) and "beautiful fragrance" (japanese). Mika is also the feminine version of (Mike) Michael which also means "who is like God" or "Gift from God." The KA (in miKA) means Spirit, rather, the spiritual part of us - life force - that survives after physical death. Ancient Egyptians refer to KA as a return to the opening or birthplace. Interestingly, I discovered an ancient legend of the panther who comes out of his den after three days and roars over the land and all who are near and awakened in Love can smell a sweet fragrance in the air. The panther has also been associated with Christ and "sweet fragrance" has always been linked to the scent emitted by enlightened beings. I later learned that IK (in mIKa) is the 2’nd Day Sign in the Mayan Zodiac representing Wind and symbolic of the Breath of Life. So much can be said about the Breath. In 2015, synchronicity led me to explore the White Lion Prophecies. I found Linda Tucker's book "Mystery of the White Lions" and the pieces came together during a period of accelerated synchronicity and awakening. Late 2015 I began creating mala beads with lion pendants to honor the message of the white lions. I named this venture, "Mika Malas" after the black jaguar whom visited in 2014. Then in 2016, six months after creating Mika Malas, I journeyed to South Africa with a Shamanic group to meet Linda and the Majestic White Lions of Timbavati. There are no words to describe being in the physical presence of these Sirian Avatar messengers. They are pure heart healers. By the end of our stay, my whole body electrified whenever they were near. Following the trip to South Africa in early 2016, my seeking intensified. I withdrew from all the spiritual dependencies and thought I had been accustomed to relying on and went into an 18 month solitude (as much as a mom can!). Several months in, while going about my daily routine I was suddenly taken into non dual reality where the “I” (identity) dissolved. After a few minutes, I began to experience the sensation of fear as I went further into the non dual experience and then I was jolted “back." I came away from that experience feeling that there was a "death process" underway, which was a rather uneasy feeling. Six months later, by auspicious synchronicity, my intense seeking for Truth when my Guru, Sri Bhagavan Paramahamsa Nithyananda found me. My soul was immediately (and continues to be) quenched by the ancient Vedic enlightenment sciences of Advaitha (non-duality) that he so beautifully shares. Kalā (in miKALA) is a Sanskrit name, inspired from a Satsang (spiritual discourse) by my Guru where he spoke of ART. He shared how by infusing our Prana into art, it becomes Kalā. That the most important action we can take is to forget the calculations and simply breathe life into our Art. That we must KNOW we give LIFE to our art. It becomes Alive. The art is dependent upon YOU to give life to it. And so Mika became MiKALA in early 2018. The creations here represents three continents of personal discoveries and an overall vision of leadership and spiritual breakthrough for humanity with the necessity for each of us to courageously and ferociously choose to come out of delusion, patterns and pain and see Reality / Truth as it is. Our Royal heritage is to ferociously choose our higher identity and create our reality from the space of Oneness, where Love overflows. We are Responsible for ourselves and for each other in this journey. It is a brave and courageous undertaking to face oneself and be willing to release the false identities. We are each walking each other home, as mirrors, and we are all are Shiva / Shakti beneath the patterns - so we must love each other and ourselves (ferociously) as we step out of the lower identities into the truth of who we are. THIS is why Lion & Lioness spirit medicine is so powerful. They speak into our higher potentials, lineage and leadership, plus the qualities that can support us right now. Be Powerful - We are literally at the edge of a breakthrough for humanity. Your gifts and talents matter - every day and in every way. Oh yes dear Lioness, You are so Loved. Your big sensitive heart is a rare breed indeed, and the world (desperately) needs your Love. Join the pride for special announcements, insights on being powerful & radiant, plus exclusive access to the limited edition collections and sales.